데이터 탐색 자습서를 시작합니다.Welcome to the exploring data tutorial. 여기서는 Power BI에서 데이터를 찾고 데이터에 연결하고 데이터와 상호 작용하는 방법을 살펴봅니다.Here you'll learn how to find, connect to, and interact with data in Power BI. 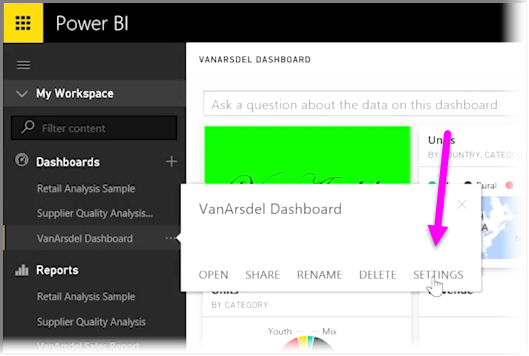 Power BI에 대한 단계별 학습 과정의 데이터 탐색 단원을 시작하겠습니다.Welcome to the Exploring Data section of the Guided Learning course for Power BI. Power BI Desktop 및 데이터를 가져오고 시각화하는 방법을 알았으므로 Power BI 서비스에서 데이터를 탐색할 준비가 되었습니다.Now that you know about Power BI Desktop, and how to get and visualize data, you're ready to explore data in the Power BI service. 이 단원에서는 Power BI의 멋진 대화형 작업 및 공유 기능과 함께 다양한 내용을 학습합니다.There are all sorts of things to learn in this section, and the compelling interactivity and sharing of Power BI really shines here. 매력적이고 흥미로운 단원을 학습할 준비를 하세요.So get ready for an engaging and interesting section. 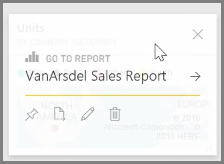 Power BI 서비스는 Power BI Desktop의 자연스로운 확장으로서, 해당 기능에는 보고서 업로드, 대시보드 만들기, 자연어를 사용하여 데이터에 대해 질문하기 등이 있습니다.The Power BI service is the natural extension of Power BI Desktop, and its features include uploading reports, creating dashboards, and asking questions of your data using natural language. 서비스를 사용하여 데이터 새로 고침 시간을 설정하고, 데이터를 조직과 공유하고, 사용자 지정 서비스 팩을 만들 수 있습니다.You can use the service to set data refresh times, share data with your organization, and create customized service packs. 다음 항목에서는 Power BI 서비스를 둘러보고, 이를 통해 비즈니스 인텔리전스 데이터를 데이터 통찰력 및 공동 작업을 통한 의사 결정 환경으로 전환할 수 있는 방법을 알아봅니다.In the following topics, we'll explore the Power BI service, and show you how it can turn your business intelligence data into data insights and a collaborative decision-driving environment. Power BI 서비스에서 대시보드, 보고서 또는 데이터 세트를 사용하는 경우 Power BI에서 데이터 정보를 신속하게 활용할 수 있습니다.When you're working with a dashboard, report, or dataset in the Power BI service, you can have Power BI look for quick insights into the data. Power BI의 왼쪽 창에 있는 데이터 세트 섹션에서 관심 있는 데이터 세트 옆의 줄임표(...)를 선택합니다.In Power BI, from the Datasets section in the left pane, select the ellipses (the three dots) beside the dataset you're interested in. 옵션 메뉴가 나타나고 맨 오른쪽에 빠른 정보 활용이라는 옵션이 표시됩니다.A menu of options appears, and on the far right you'll see an option called Quick Insights. 빠른 정보 활용을 선택하면 Power BI에서 일부 기계 학습을 수행하고 데이터를 검색한 후 이를 분석하여 빠른 정보 활용을 찾습니다.When you select Quick Insights, Power BI performs some machine learning and searches the data, analyzing it to find quick insights. 서비스의 오른쪽에 Power BI가 정보를 찾고 있음을 나타내는 알림이 표시됩니다.You'll see a notification in the upper-right side of the service that indicated Power BI is working on finding insights. 15초 정도 지난 후 Power BI에서 몇 가지 정보를 찾았음을 알 수 있도록 알림이 변경됩니다.After fifteen seconds or so, the notification changes to let you know that Power BI found some insights. 알림에서 정보 보기 단추를 선택하면 다음 그림처럼 Power BI에서 찾은 정보가 표시된 시각적 개체 페이지가 제공됩니다.When you select the View insights button on the notification, you're presented with a page of visuals that show the insights that Power BI found, similar to what you see in the following image. 많은 정보가 있는 경우 페이지를 아래로 스크롤하여 보고 검토할 수 있습니다.There are a bunch of insights, which you can scroll down through the page to view and consider. 다른 시각적 개체와 마찬가지로 빠른 정보 활용 페이지에서 시각적 개체와 상호 작용할 수 있으며, 원하는 시각적 개체를 대시보드에 고정하거나 하나 이상의 시각적 개체를 추가로 필터링하여 궁금한 추가 정보를 검색할 수도 있습니다.Like any other visual, you can interact with the visuals in the Quick Insights page, and you can also pin any of them to a dashboard that you might have, or further filter one or more of them (or as many as you like), to search for additional insights that might be waiting on your curiosity to uncover. 빠른 정보 활용을 사용하면 Power BI에서 데이터의 이상값 및 추세를 발견한 다음 대시보드에서 이를 사용하거나 더욱 구체화하고 필터링하여 자신에게 가장 중요한 정보를 얻을 수 있습니다.With Quick Insights, you can let Power BI do the work to spot outliers and trends in your data, then use those findings in your dashboards, or further refine and filter them to get to the insights that are most important to you. 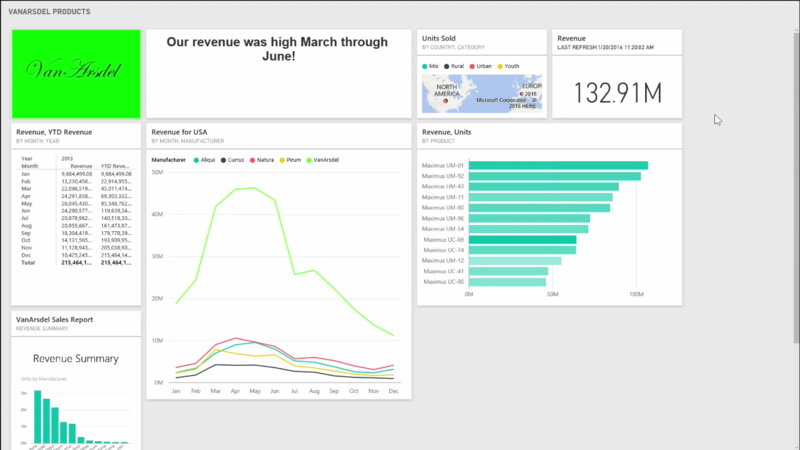 Power BI의 대시보드는 Power BI 서비스 내에서 생성된 한 페이지로 된 시각화의 컬렉션입니다.Dashboards in Power BI are one-page collections of visualizations that are created from within the Power BI service. 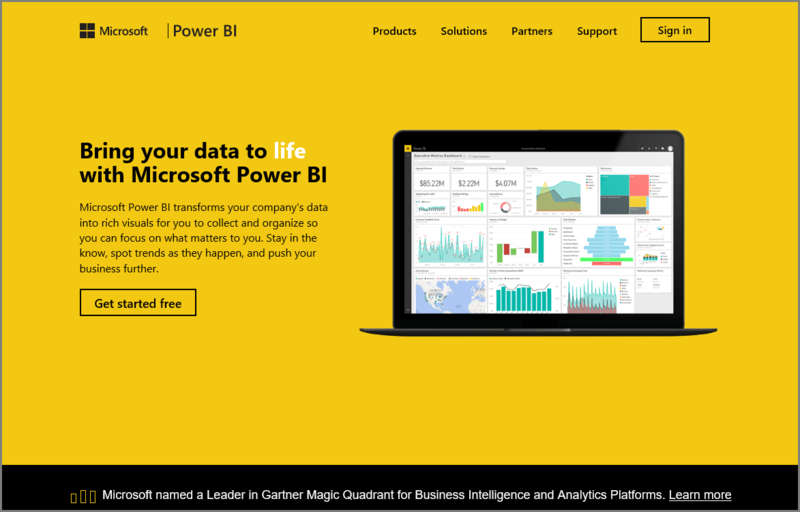 Power BI Desktop을 사용하여 작성하고 게시한 보고서의 시각화 또는 Power BI 서비스 자체 내에서 만든 시각화를 고정하여 대시보드를 만듭니다.You create dashboards by pinning visualizations from reports that you authored and published using Power BI Desktop, or visualizations you created within the Power BI service itself. 시각적 개체를 대시보드에 고정하는 것은 그림을 벽에 거는 것과 같습니다. 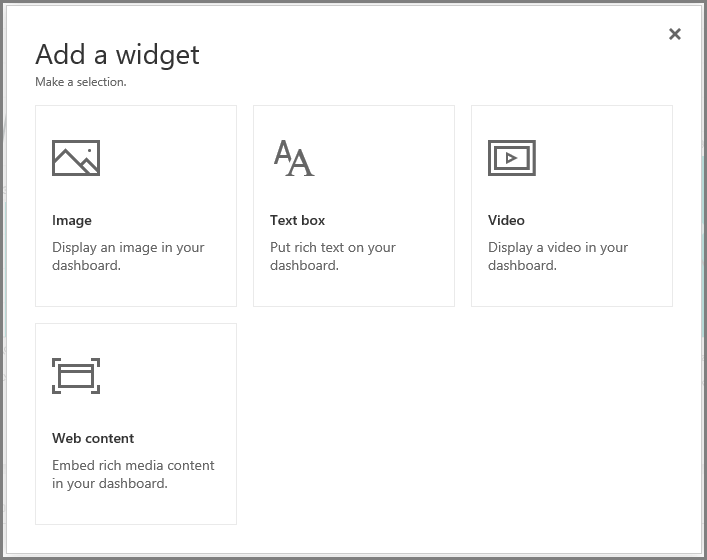 다른 사람이 볼 수 있도록 특정 지점에 시각적 개체를 부착하는 것입니다.Pinning a visual to a dashboard is a lot like pinning a picture to a corkboard on a wall - it sticks the visual there, in a particular spot, for others to see. 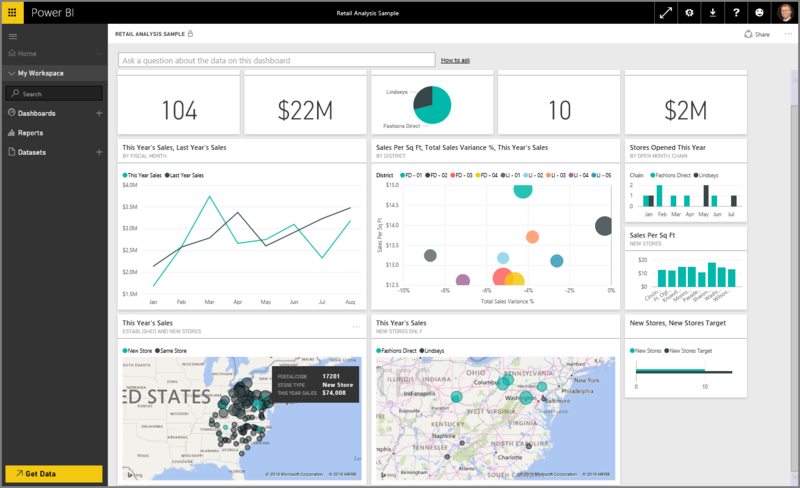 시각적 개체를 고정하려면 Power BI 서비스에서 해당 보고서를 엽니다.To pin a visual, open its report on the Power BI service. 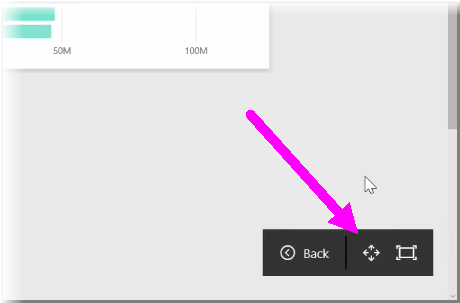 고정하려는 시각적 개체를 마우스로 가리키고 고정 아이콘을 선택합니다.Hover over the visual you want to pin and select the pin icon. 드롭다운 메뉴에서 시각적 개체에 대한 대상 대시보드를 선택하거나 새 대시보드를 만들 수 있는 대화 상자가 나타납니다.A dialog appears, where you select a destination dashboard for the visual from the drop-down menu, or you can create a new dashboard. 고정된 시각적 개체가 대시보드에 어떻게 표시되는지를 미리 볼 수도 있습니다.You also get a preview of what the pinned visual will look like in the dashboard. 여러 보고서 및 페이지의 시각화를 단일 대시보드에 고정하여 여러 데이터 세트 및 소스를 단일 정보 페이지에 통합할 수 있습니다.You can pin visualizations from multiple reports and pages to a single dashboard, allowing you to combine different datasets and sources into a single page of insights. 대시보드에서 "고정"하여 그래프, 지도, 이미지, 도형 등 모든 종류의 시각화를 추가할 수 있습니다.On Dashboards, you can add any sort of visualization including graphs, maps, images, and shapes, by "pinning" them. 시각적 개체가 대시보드에 고정되면 이를 타일이라고 합니다.Once a visual is pinned to a dashboard, it's called a tile. 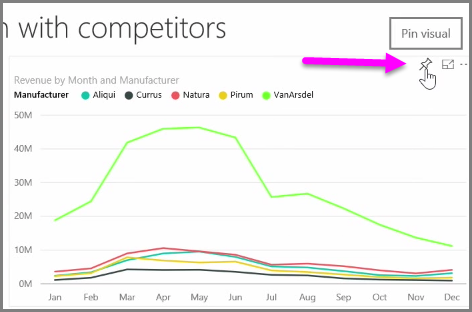 모든 새 대시보드를 포함하여 대시보드는 Power BI 서비스의 왼쪽에 있는 대시보드 섹션에 표시됩니다.Your dashboards, including any new ones, appear in the Dashboards section on the left side of the Power BI service. 목록에서 대시보드를 선택하면 해당 대시보드가 표시됩니다.Select a dashboard from the list to view it. 대시보드에서 시각적 개체의 레이아웃을 원하는 대로 변경할 수 있습니다.You can change the layout of visuals on a dashboard however you'd like. 타일 크기를 조정하려면 핸들을 끕니다. 타일을 이동하려면 클릭하여 대시보드의 다른 위치로 끌어 옵니다.To resize a tile, drag its handles in or out. 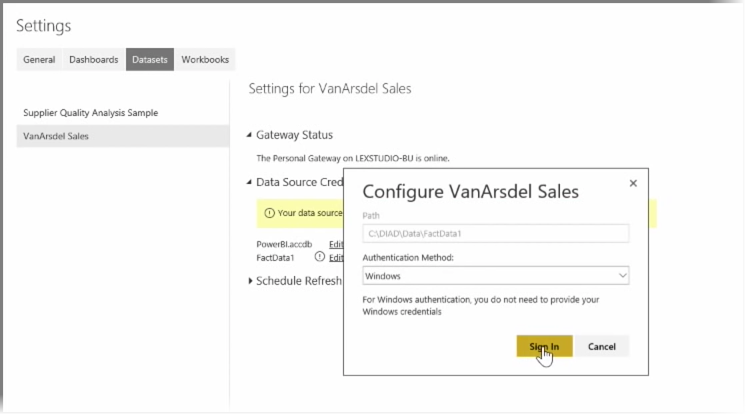 To move a tile, simply click and drag it to a different location on the dashboard. 타일을 가리키고 연필 아이콘을 클릭하면 제목 또는 부제목을 변경할 수 있는 타일 세부 정보가 열립니다.Hover over a tile and click the pencil icon to open the Tile Details, where you can change the Title or Subtitle. 대시보드 타일을 클릭하면 원래의 보고서가 표시됩니다.Click on a dashboard tile to view the report from which it originated. 이를 통해 시각적 개체의 기본 데이터를 신속하게 볼 수 있습니다.This lets you quickly view the underlying data beneath a visual. 또한 타일 세부 정보에서 사용자 지정 링크 설정 필드를 사용하여 해당 링크를 변경할 수 있습니다.You can also change that link by using the Set custom link field in Tile Details. 예를 들어 대시보드 컬렉션이 있을 때 하나의 요약 대시보드를 만들려는 경우 하나의 대시보드에서 다른 대시보드로 타일을 고정할 수 있습니다.You can pin tiles from one dashboard to another, for example if you have a collection of dashboards and want to create one summary board. 프로세스는 동일합니다. 타일을 가리키고 고정 아이콘을 선택합니다.The process is the same: hover over the tile and select the pin icon. 대시보드는 만들고 변경하기 쉽습니다.Dashboards are easy to create, and to change. 또한 한 페이지 대시보드에 정확히 필요한 내용만 표시되도록 대시보드를 사용자 지정할 수 있습니다.And you can customize them to make your one-page dashboard show exactly what it should. Power BI에는 대화 구문과 질문을 사용하여 데이터에 대해 질문할 수 있는 강력한 언어 인식 엔진이 제공됩니다.Power BI comes with a powerful language recognition engine that lets you ask questions of your data using conversational phrases and questions. Power BI를 사용하여 보고서 및 시각화를 작성할 때 간단한 질문을 통해 차트 및 그래프를 만들 수 있습니다.So along with building reports and visualizations with Power BI, you can create charts and graphs just by asking simple questions. 데이터에 대해 질문하려면 Power BI에서 대시보드를 엽니다. 그러면 화면 위에 표시된 데이터에 대해 질문할 수 있는 입력 상자가 표시됩니다.To ask a question of your data, open a dashboard in Power BI and the top of the screen you'll see an input box, where you can ask questions about the displayed data. 이 기능을 질문 및 답변이라고도 하며, 종종 Q&A라고도 합니다.This feature is sometimes referred to as Questions & Answers, or more often, this feature is just referred to as Q&A. 상자를 클릭하면 Power BI에서 데이터를 기반으로 "YTD revenue"와 같은 몇 가지 제안된 용어를 표시합니다.When you click in the box, Power BI displays prompts with some suggested terms based on your data, such as "YTD revenue". 제안된 용어를 클릭하면 결과가 표시되는데, 종종 간단한 테이블 또는 카드로 표시됩니다.You can click on a suggested term to see the result, often displayed as a simple table or card. 제안된 구문 중 하나를 선택하면 해당 구문에 따라 자동으로 시각적 개체가 실시간으로 생성됩니다.When you select one of the suggested phrases, Power BI automatically creates a visual based on your selection, in real time. "What was our revenue last year?" 또는 "What product had the highest sales in March 2014? "와 같은You can also ask questions using natural language, such as "What was our revenue last year?" 자연어를 사용하여 질문할 수도 있습니다.or "What product had the highest sales in March 2014?". Power BI에서 질문에 대한 해석을 표시하고 답변을 나타내는 데 가장 적합한 유형의 시각적 개체를 선택합니다.Power BI displays its interpretation of your question, and chooses the best type of visual to represent the answer. Power BI의 다른 시각적 개체와 마찬가지로 고정 아이콘을 클릭하여 선택한 대시보드에 고정할 수 있습니다.And just like any other visual in Power BI, you can pin it to the dashboard of your choice by selecting the pin icon. 언제든지 자연어 질문 또는 구문으로 생성된 시각적 개체를 편집할 수 있습니다.At any point along the way, you can edit the visual created by your natural language question or phrase. 화면 오른쪽에 있는 시각화 및 필드 창을 사용하면 됩니다.Just use the Visualizations and Fields panes on the right side of the screen. Power BI의 다른 모든 시각적 개체와 마찬가지로 레이아웃을 변경하고, 필터를 조정하고, 필드 입력을 변경할 수 있습니다.Like any other visual in Power BI, you can alter the layout, adjust filters, and change the field inputs. 대시보드에 시각화를 저장하려면 완벽한 시각적 개체를 만든 후 질문 입력 상자 옆의 고정 아이콘을 선택하기만 하면 됩니다.To save the visualization to a dashboard once you've created the perfect visual, just select the pin icon next to the question input box. Power BI를 사용하면 대시보드에 자연어 쿼리 상자를 사용하는 다른 사용자에 대한 사용자 고유의 제안된 질문을 추가할 수 있습니다. 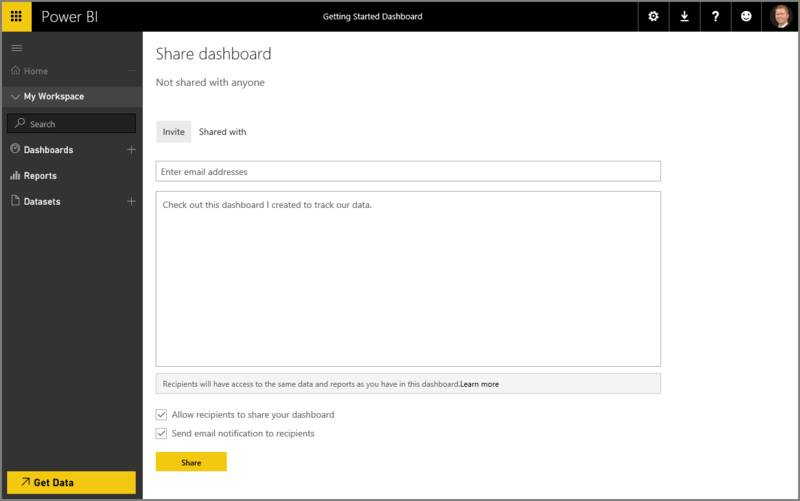 이를 종종 Q&A 상자라고 합니다.With Power BI, you can add your own suggested questions for other users who use the natural language query box for a dashboard, frequently referred to as the Q&A box. 이러한 제안된 질문은 사용자가 대시보드 위에 있는 입력 상자를 클릭하면 나타납니다.These suggested questions are what users will see when they click on the input box at the top of a dashboard. 사용자 고유의 질문을 추가하려면 사용할 대시보드 이름 옆의 줄임표(...)를 선택한 다음 메뉴에서 설정을 선택합니다.To add your own questions, select the ellipses (the three dots ...) next to the name of the dashboard you want to use, and select Settings from the menu. 그러면 대시보드에 대한 설정 페이지 및 기본 데이터 세트 또는 통합 문서가 열립니다.This opens the Settings page for the dashboard and underlying datasets or workbooks. Q&A 검색 입력 상자를 설정 페이지의 대시보드 섹션에서 완전히 사용하지 않도록 설정할 수 있지만 질문을 추가할 것이므로 데이터 집합 섹션을 선택합니다.You can disable the Q&A search input box completely from the Dashboards section of the Settings page, but we want to add questions, so we select the Datasets section. 데이터 집합 섹션에는 대시보드와 연결된 모든 데이터 집합이 표시됩니다.In the Datasets section, all datasets associated with the Dashboard are displayed. 목록에서 대시보드와 연결된 데이터 집합을 선택하고, 추천 Q&A 질문을 선택한 다음, 질문 추가 링크를 선택합니다.Select the dataset associated with your dashboard from the list, select Featured Q&A Questions, then select the Add a question link. 입력 상자에 질문 또는 프롬프트를 입력하고 적용을 선택합니다.Enter your question or prompt into the input box and select Apply. 이제 누구든 선택된 대시보드에서 검색 입력 상자를 클릭하면 프롬프트 목록 위에 제안된 항목이 표시되며, 이 질문을 선택하면 Q&A 답변으로 바로 이동합니다.Now any time someone clicks on the search input box on the selected dashboard, they'll see your suggested entries at the top of the prompt list, and selecting that question will take them right through to the Q&A answer. 이는 대시보드 사용자가 사용 가능한 데이터 형식과 이를 최대한 활용할 수 있는 방법을 생각하는 데 매우 유용합니다.This is a valuable way to get dashboard users thinking about the type of data available, and how they can best use it. Power BI를 통해 데이터를 찾고, 데이터 모델에 수집하고, 이 데이터를 사용하여 보고서 및 시각화를 작성하는 방법은 이미 살펴보았습니다.We've already seen how Power BI helps you find data, collect it in a data model, and build reports and visualizations on using that data. 또한 이러한 보고서를 Power BI 서비스에 게시하고 시간에 따른 정보를 모니터링하는 데 도움이 되는 대시보드를 만드는 방법도 살펴보았습니다.We've also seen how you can publish those reports to the Power BI service, and create dashboards that help you monitor your information over time. 이 모든 기능은 조직의 다른 사람과 정보를 공유할 때 훨씬 더 강력합니다.All these features are even more powerful when you share your insights with others in your organization. 다행히 대시보드를 쉽게 공유할 수 있습니다.Fortunately, sharing your dashboards is easy. 대시보드를 공유하려면 Power BI 서비스에서 대시보드를 열고 오른쪽 위에 있는 공유 링크를 선택합니다.To share a dashboard, open it in the Power BI service and select the Share link in the top right-hand corner. 대시보드 공유 페이지가 나타납니다. 여기서 초대 섹션을 선택한 다음, 대시보드에 대한 액세스 권한을 부여하려는 사람으로 이메일 주소 입력 상자를 채울 수 있습니다.The Share Dashboard page appears, where you can select the Invite section, then fill in the Email address input box with people you'd like to grant access to your dashboard. 이메일 주소를 입력할 때 Power BI에서는 사용자 도메인 및 Office 365 도메인 계정을 확인하여 가능한 경우 자동으로 완성합니다.Power BI checks the email addresses as you type them with accounts in your domain and Office 365 domain, and auto-complete when possible. 이메일 주소를 이 상자에 복사하여 붙여 넣거나, 메일 그룹, 보안 그룹 또는 Office 365 그룹을 사용하여 여러 사람에게 한 번에 연결할 수 있습니다.You can also copy and paste email addresses into this box, or use a distribution list, security group, or Office 365 group to reach multiple people at once. 아래쪽에 있는 받는 사람에게 이메일 알림 보내기 확인란을 선택한 경우 받는 사람에게 링크를 포함하여 대시보드가 공유되었음을 알리는 메일이 제공됩니다.If you selected the checkbox (near the bottom) to send email notification to recipients, then your recipients will receive an email letting them know that you shared a dashboard with them, including a link with the dashboard. 받는 사람에게 제공되는 메일에 메모를 추가하거나, Power BI에서 생성된 메모(메일 주소 입력란 바로 아래의 상자에 있음)를 보낼 수 있습니다.You can add a note to the email they will receive, or send the note that Power BI created for you (it's in the box directly below where you enter their email addresses). 기존 Power BI 계정이 없는 받는 사람은 등록 프로세스를 거쳐야 대시보드를 볼 수 있습니다.Recipients without an existing Power BI account will be taken through the sign-up process before viewing your dashboard. 대시보드를 공유하는 모든 사람은 정확히 사용자와 동일한 방식으로 대시보드를 보고 상호 작용할 수 있습니다.Anyone with whom you share a dashboard can see and interact with it exactly as you do. 그러나 기본 보고서에 대한 읽기 전용 권한을 가지며, 기본 데이터 세트에 대한 액세스 권한은 없습니다.However, they have read-only access to the underlying reports, and they have no access to the underlying datasets. 대시보드 공유 페이지에서 공유 대상 탭을 선택하여 이전에 이 대시보드를 공유한 대상을 볼 수 있습니다.You can also select the Shared With tab on the Share Dashboard page to see the people with whom you have previously shared this dashboard. 서비스에서 Power BI 대시보드 또는 보고서를 확인할 때 개별 차트 또는 시각화에 포커스를 두는 것이 유용할 때가 있습니다.When you're looking at Power BI dashboards or reports in the service, it can sometimes be helpful to focus on an individual chart or visualization. 두 가지 방법으로 이를 수행할 수 있습니다.You can do that in two different ways. 대시보드에서 타일을 가리키면 오른쪽 위에 몇 가지 아이콘 옵션이 표시됩니다.When you're on a dashboard, hover over a tile to see a few different icon options in the top right-hand corner. 줄임표(...)를 선택하면 타일에서 수행할 수 있는 작업을 나타내는 아이콘 컬렉션이 표시됩니다.When you select the ellipses (the three dots) you see a collection of icons that represent actions you can take on the tile. 맨 왼쪽에 있는 아이콘에는 포커스 모드로 레이블이 지정됩니다.The left-most icon is labeled Focus mode. 이 아이콘을 선택하면 전체 대시보드 공간을 포함하도록 타일이 확장됩니다.Select that icon to expand the tile to encompass the full dashboard space. 포커스 모드에서는 시각적 개체 및 범례에 대한 보다 자세한 정보를 볼 수 있습니다.Focus mode allows you to see a lot more detail on your visuals and legends. 예를 들어 Power BI에서 타일 크기를 조정할 때 타일의 사용 가능한 공간 때문에 일부 열이 표시되지 않을 수 있습니다.For example, when you resize a tile in Power BI, some of the columns may not be shown because of the space available in the tile. 포커스 모드에서는 모든 데이터를 볼 수 있습니다.In Focus mode, you can see all the data. 또한 고정 아이콘을 선택하여 포커스 모드에서 다른 대시보드로 시각적 개체를 직접 고정할 수 있습니다.You can also pin the visual directly from Focus mode to a different dashboard by selecting the Pin icon. 포커스 모드를 종료하려면 포커스 모드 왼쪽 위에 있는 뒤로... 아이콘을 선택합니다.To exit Focus mode, select the Back to... icon in the top-left corner of Focus mode. 보고서를 볼 때와 프로세스와 유사합니다.The process is similar when viewing a report. 시각적 개체를 가리키면 오른쪽 위에 세 개의 아이콘이 표시됩니다. 여기서 포커스 모드 아이콘을 선택합니다.Hover over a visual to see the three icons in the top-right corner, and select the Focus mode icon. 이 아이콘을 선택하면 전체 보고서 캔버스를 포함하도록 시각화가 확장됩니다.Selecting this expands your visualization to encompass the full report canvas. 이 모드에서는 시각화 간의 교차 필터 효과가 일시적으로 손실되지만 시각적 개체는 여전히 대화형입니다.The visual is still interactive in this mode, although you temporarily lose any cross-filter effect between visualizations. 확장된 타일 또는 보고서를 가리키고 왼쪽 위에 있는 뒤로... 왼쪽 삽입 아이콘을 선택하면 이전 뷰로 돌아갑니다.Hover over an expanded tile or report and select the Back to... left-caret icon in the top-left corner to return to the previous view. 대시보드를 작성한 후에는 Power BI 서비스에서 해당 * 타일을 편집하여 몇 가지 서식을 변경할 수 있습니다.Once you've built a dashboard, you can edit its *Tiles in the Power BI service to make a few formatting changes. 타일을 변경하려면 해당 타일을 가리키고 줄임표(...)를 선택하여 타일을 변경하는 데 사용할 수 있는 아이콘 컬렉션을 표시합니다.To make changes to a tile, hover over the tile and select the ellipses (three dots) to show a collection of icons that allow you to make changes to the tile. 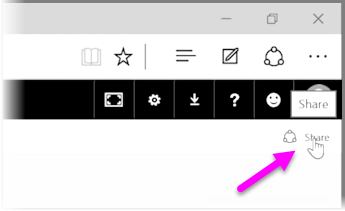 펜 아이콘을 선택하면 타일 세부 정보 창이 열립니다.Select the pen icon to open the Tile Details pane. 여기에서 타일의 제목, 부제목을 변경하고, 마지막 새로 고침 시간 및 날짜를 포함할 수 있으며 사용자 지정 링크 만들기와 같은 기타 세부 정보를 변경할 수 있습니다.From here you can change the tile's Title, Subtitle, include its last refresh time and date, and other details such as creating a custom link. 대시보드 타일을 클릭하면 기본적으로 원래의 보고서로 이동합니다.By default, when you click on a dashboard tile you are taken to the report from which it originated. 이 동작을 변경하려면 타일 세부 정보 창에서 사용자 지정 링크 설정 필드를 사용합니다.To change this behavior, use the Set custom link field in the Tile Details pane. 이 기능은 사용자가 로고 이미지를 클릭하면 조직의 홈 페이지로 이동하는 경우 등에 널리 사용됩니다.One popular use of this feature is to take users to the organization homepage when clicking on a logo image. 대시보드에 위젯을 추가할 수도 있습니다.You can also add widgets to your dashboard. 위젯은 시각화를 포함하는 대신 이미지, 온라인 동영상, 텍스트 상자 또는 풍부한 웹 콘텐츠 등의 다른 항목을 포함하는 특수한 대시보드 타일입니다.A widget is a special dashboard tile that, instead of containing a visualization, contains other items such as an image, an online video, a text box, or rich web content. 대시보드 오른쪽 위에서 위젯 추가 링크를 선택하면 위젯 추가 대화 상자가 나타납니다.When you select the Add Widget link in the upper-right corner of a Dashboard, the Add a widget dialog appears. 예를 들어 텍스트 상자를 추가하는 경우 오른쪽에 타일 세부 정보 창이 나타납니다. 이 창에서 타일의 세부 정보를 편집할 때 사용할 수 있는 것과 유사한 세부 정보를 편집할 수 있습니다.When you add a text box, for example, a Tile details pane appears on the right side, where you can edit details similar what is available when editing the details of any tile. 그러나 위젯을 사용하면 위젯 내용을 정의하거나 수정할 수 있는 섹션(텍스트 상자에 제공되는 서식 있는 텍스트 편집기와 유사)도 제공됩니다.But with widgets, there's also a section to define or modify the widget content, such as a rich text editor for a text box. 위젯 및 타일 세부 정보 편집 기능을 통해 대시보드를 사용자 지정하고 원하는 방식으로 표시할 수 있습니다.With widgets and the ability to edit tile details, you can customize your dashboard and make it look just how you want it to be. 대시보드를 만들 때 캔버스에 표시할 수 있는 것보다 콘텐츠가 더 많은 경우가 있을 수 있습니다.You may find that occasionally when you create your dashboards, you have more content than what can fit on your canvas. 전체 대시보드 내용을 볼 수 있도록 대시보드 공간 표시 방법을 관리하는 데 도움이 되는 몇 가지 솔루션이 있습니다.There are a few solutions that help you manage how your dashboard space is displayed, so you can get a full view of your dashboard content. 전체 대시보드를 하나의 화면에 표시하는 가장 쉬운 방법은 대시보드의 오른쪽 위에 있는 전체 화면 모드 단추를 선택하는 것입니다.The easiest method to display your entire dashboard in one screen is selecting the Full Screen Mode button in the top right-hand corner of the dashboard. 전체 화면 모드 단추를 선택하면 브라우저가 전체 화면 모드로 전환되며, 대시보드 주위의 모든 크롬 요소가 제거되어 볼 수 있는 공간이 증가합니다.Selecting the Full Screen Mode button puts your browser into full screen mode, removing all chrome elements from around the dashboard, and thereby increasing the amount of viewable space. 전체 화면 모드 내에서 화면에 맞추기 옵션을 선택하면 스크롤 막대 없이 단일 화면에 표시되도록 모든 타일이 축소됩니다.From within Full-Screen Mode, you can select the Fit to Screen option to shrink all of your tiles so they fit on a single screen, without the need for scrollbars. 이를 일반적으로 TV 모드라고 하며, 대시보드를 사용하여 프레젠테이션을 제공하거나 복도 모니터에 대시보드를 표시하는 데 유용합니다.This is commonly called TV mode, and is useful for giving presentations with dashboards, or displaying a dashboard on hallway monitors. 대시보드 공간을 관리하는 또 다른 방법은 햄버거 아이콘을 선택하여 페이지 왼쪽에 있는 탐색 창을 축소하는 것입니다.Another way to manage dashboard space is collapsing the Navigation pane on the left-hand side of the page, by selecting the hamburger icon. 탐색 창을 확장하려면 해당 아이콘을 다시 클릭합니다.To expand the navigation pane, click the icon again. 이 링크를 따르는 사용자에게는 축소된 탐색 모음이 있는 대시보드가 열립니다.Users who follow that link will open the dashboard with a collapsed navigation bar. 이전 항목에서는 Power BI를 사용하여 데이터 원본에 연결하는 방법 및 Power BI 서비스에서 데이터 세트를 수동으로 새로 고치는 방법을 알아보았습니다.In previous topics we've looked at how you can use Power BI to connect to data sources, and how to manually refresh your datasets on the Power BI service. 그러나 데이터 변경 내용을 매번 수동으로 새로 고치지는 않을 것이므로 Power BI를 사용하여 예약된 새로 고침을 설정할 수 있습니다. 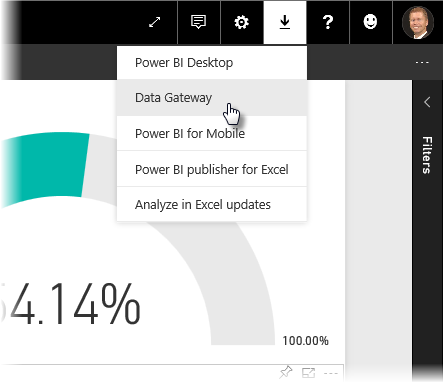 예약된 새로 고침은 자동으로 데이터에 연결하여 Power BI 서비스에 데이터를 게시합니다.However, you're not going to want to manually refresh things every time your data changes, so you can use Power BI to set up a scheduled refresh that will connect to your data sources and publish them into the Power BI Service automatically. 이를 통해 서비스를 Excel 파일, Access 데이터베이스, SQL 데이터베이스 등의 모든 온-프레미스 데이터 소스에 연결할 수도 있습니다.This also gives you a way to connect the service with any on-premises data sources, including Excel files, Access databases, SQL databases, and more. 온-프레미스 데이터 소스를 Power BI 서비스에 연결할 수 있도록 해주는 시스템을 데이터 게이트웨이라고 합니다.The system that lets you connect your on-premises data sources to the Power BI service is called the data gateway. 이는 사용자 컴퓨터에서 실행되는 작은 애플리케이션으로, 미리 정렬된 일정을 사용하여 데이터에 연결하고 업데이트를 수집한 후 Power BI 서비스에 푸시합니다.It's a small application that runs on your computer, and uses a pre-arranged schedule to connect to your data, gather any updates, and push them up to the Power BI service. 개인 게이트웨이는 관리자 구성 없이도 사용할 수 있는 데이터 게이트웨이의 한 버전입니다.The personal gateway is a version of the data gateway that can be used without any administrator configuration. 개인 게이트웨이가 제대로 작동하려면 Power BI 개인 게이트웨이를 실행하는 컴퓨터가 반드시 켜져 있고 인터넷에 연결되어 있어야 합니다.The computer that is running the Power BI personal gateway must be on and connected to the Internet for personal gateway to work properly. 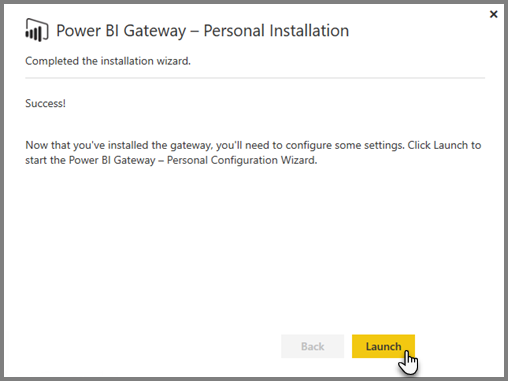 개인 게이트웨이를 설치하려면 먼저 Power BI 서비스에 로그인합니다.To set up your personal gateway, first sign in to the Power BI service. 화면 오른쪽 위에서 다운로드를 선택한 다음 메뉴에서 Data Gateways를 선택합니다.Select the Download icon in the top right-hand corner of the screen, and then select Data Gateways from the menu. 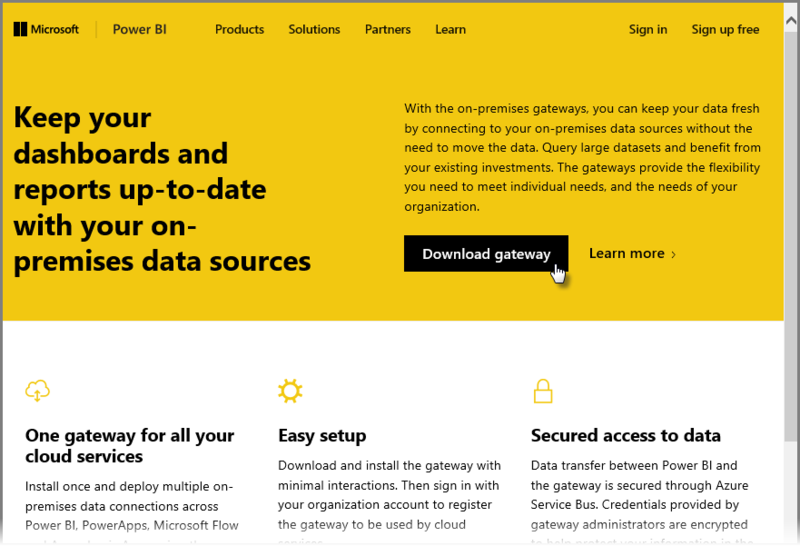 그러면 아래와 같이 Power BI Gateway - Personal을 선택할 수 있는 웹 페이지로 이동합니다.From there you'll be taken to a web page where you can select the Power BI Gateway - Personal, as shown below. 다운로드가 완료되면 애플리케이션을 실행하고 설치 마법사를 완료합니다.Run the application once it finishes downloading, and complete the installation wizard. 그런 다음 게이트웨이를 설정하기 위해 구성 마법사를 시작하라는 메시지가 나타납니다.You'll then be prompted to launch the configuration wizard to set up your gateway. 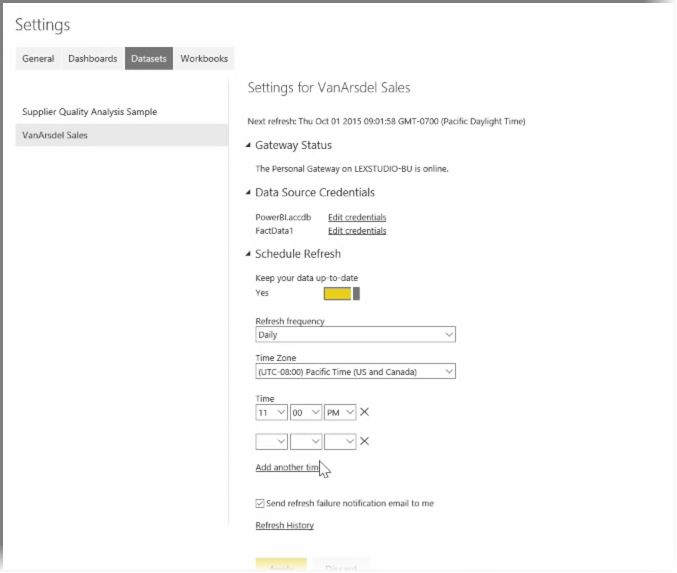 Power BI 서비스 계정에 로그인한 다음, 게이트웨이 서비스가 사용자의 계정 하에 실행되기 때문에 머신의 Windows 계정에 로그인하라는 메시지가 표시됩니다.You'll be asked first to sign in to your Power BI service account, and then to sign in to the machine's Windows account, since the gateway service runs under your account. 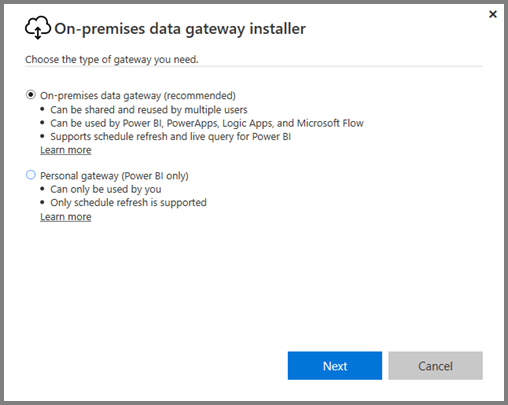 Power BI 서비스로 돌아갑니다.Return to the Power BI service. 새로 고치려는 데이터 세트 옆의 줄임표(...)를 선택한 다음, 새로 고침 예약을 선택합니다.Select the ellipsis (three dots) menu next to the dataset you want to refresh, and then select Schedule Refresh. 그러면 새로 고침 설정 페이지가 열립니다.This opens the Refresh Settings page. 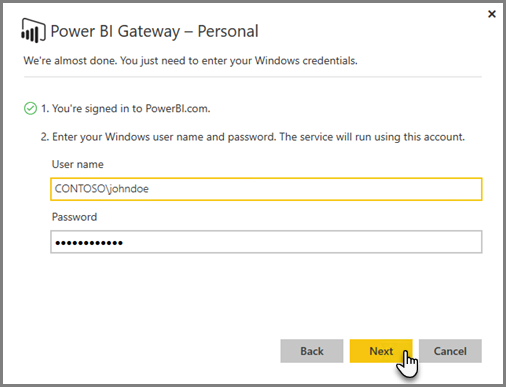 Power BI에서 개인 게이트웨이를 설치했는지 검색하여 해당 상태를 알려 줍니다.Power BI detects that you've installed a personal gateway, and lets you know its status. 적용 가능한 각 데이터 소스 옆의 자격 증명 편집을 선택하고 인증을 설정합니다.Select Edit credentials next to each applicable data source and set up authentication. 마지막으로, 새로 고침 예약 아래의 옵션을 설정하여 자동 업데이트를 활성화하고 업데이트 발생 시기 및 빈도를 설정합니다.Finally, set the options under Schedule Refresh to activate automatic updates and set when and how frequently they occur. 이것으로 끝입니다!And that's it. 예약된 시간에 Power BI는 사용자가 제공한 자격 증명 및 개인 게이트웨이가 실행 중인 컴퓨터에 대한 연결을 사용하여 이러한 데이터 원본에 연결하고 일정에 따라 보고서 및 데이터 세트를 업데이트합니다.On the scheduled times, Power BI will go out to those data sources, using the credentials you provided and the connection to the computer that has your personal gateway running, and update the reports and datasets according to your schedule. 다음에 Power BI로 이동하면 이러한 대시보드, 보고서 및 데이터 세트에 가장 최근 예약된 새로 고침 일자의 데이터가 반영됩니다.The next time you go to Power BI, those dashboards, reports, and datasets will reflect data as of the most recent scheduled refresh. 축하합니다!Congratulations! 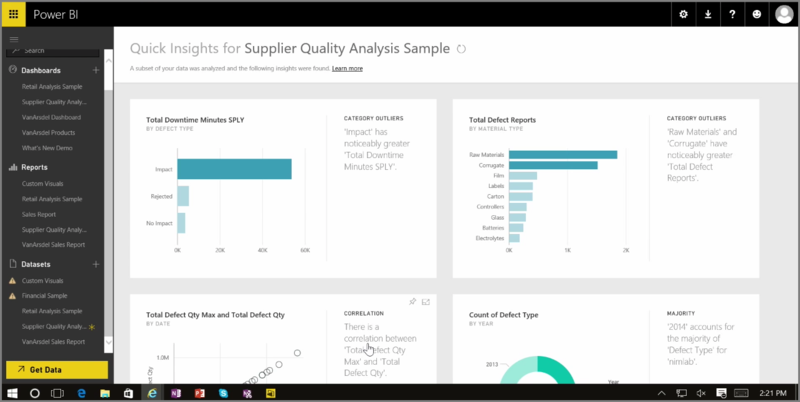 Power BI에 대한 단계별 학습 과정의 이 데이터 탐색 단원을 완료하셨습니다.You've completed this Exploring Data section of the Guided Learning course for Power BI. 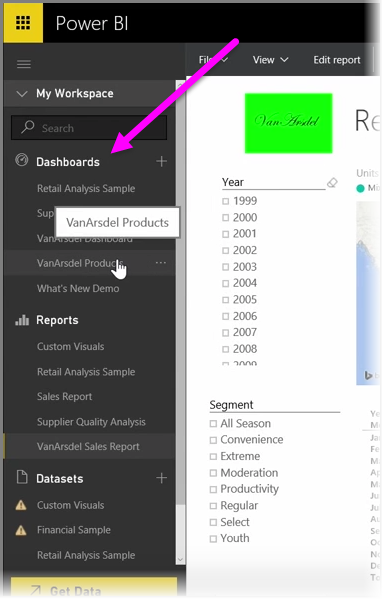 Power BI 서비스는 데이터를 탐색하고, 정보를 공유하고, 시각적 개체와 상호 작용할 수 있는 다양한 흥미로운 방법을 제공합니다.The Power BI service is full of interesting ways to explore data, share insights, and interact with visuals. 또한 어디서든 브라우저를 통해 현재 위치에 연결할 수 있는 서비스에서 액세스할 수 있습니다.And it's all accessible from a browser, from a service that you can connect to wherever you are. 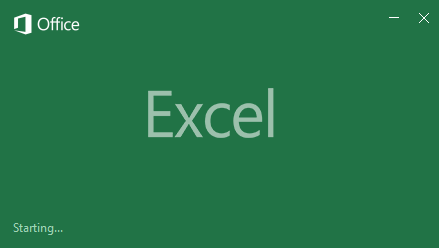 Power BI의 널리 알려진 강력한 파트너 중 하나는 Excel입니다.One powerful and well-known partner of Power BI is Excel. Power BI와 Excel은 함께 원활하게 작동하도록 설계되었습니다. 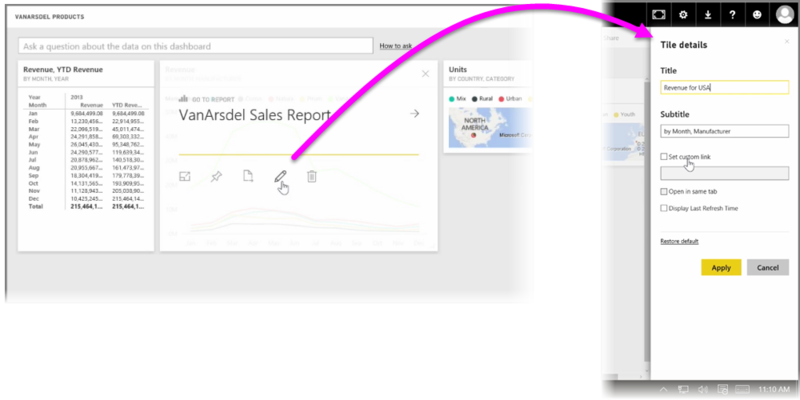 따라서 Power BI에서 통합 문서를 자유롭게 사용할 수 있습니다.Power BI and Excel are designed to work well together; your workbooks will feel at home in Power BI, and it's easy to get them there. 얼마나 쉬운지는How easy? 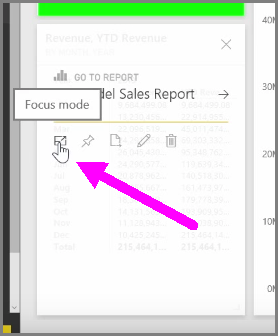 다음 단원인 Power BI 및 Excel 단원에서 정확히 알아보겠습니다.In the next section, Power BI and Excel you learn exactly that. 이 단계별 학습 과정의 데이터 탐색 섹션은 모든 종류의 데이터 형식을 다룰 수 있도록 준비하는 과정입니다.This exploring data section of Guided Learning has prepared you to work with all sorts of different data types. 다음 자습서에서는 일반적인 데이터 원본인 Excel을 사용하는 방법을 배웁니다.In the next tutorial, you learn how to use a common data source - Excel.